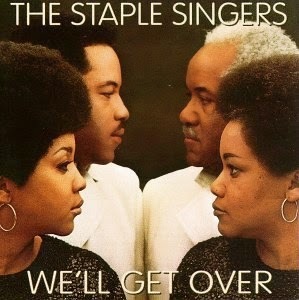 1969's We'll Get Over was The Staple Singers' second album for Stax Records, produced by Steve Cropper and featuring members of The MGs as well as keyboard player Marvell Thomas (daughter of Rufus and sister of Carla). It further explored the new secular, inspirational 'message song' format they had switched gears to the previous year, resulting in some fantastic upbeat soul music, with funky arrangements sweetened in places with strings. Most of the songs were covers, including Joe South's "Games People Play", Sly & The Family Stone's "Everyday People" and The Guess Who's "A Wednesday In Your Garden". One of the most unusual choices was "Solon Bushi", an arrangement of a traditional Japanese folk song. The album didn't generate any hit singles, but it was another step in the right direction (commercially speaking). They were making the most of their Stax record deal, as the same year saw the release of Mavis Staples' solo debut, and Pops Staples recorded an album with Cropper and fellow Stax artist Albert King. They also recorded a song by Al Kooper for the film sountrack he was working on (for Hal Ashby's 1970 film The Landlord) - "Brand New Day" is included here as a bonus track. It was also their last album to feature Pervis Staples, before he left and his place was taken by younger sister Yvonne.